The Conclusion reaffirms that aesthetic choice implies particular artistry. Notwithstanding earlier resistance to deferred, hybridised definitions, it posits the figure of the ‘director-conductor’. In terms of creativity, directing is seen as the address of creative dissatisfaction and a search for the ‘absent’. 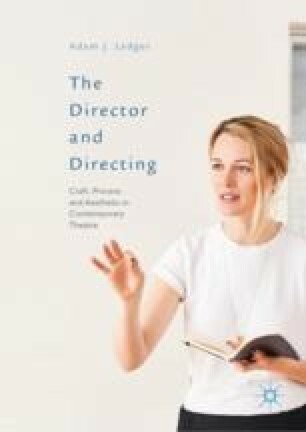 Whilst the possibilities and limits of neuroaesthetics as applied to directing are reassessed, directing is considered a determining expertise towards ‘resonant experience’ (G. Gabrielle Starr). The Conclusion also suggests further research in the area of director training. The book concludes on an anecdote, that of Carrie Cracknell’s leadership of a technical rehearsal, in which choices towards the performance event were evident.